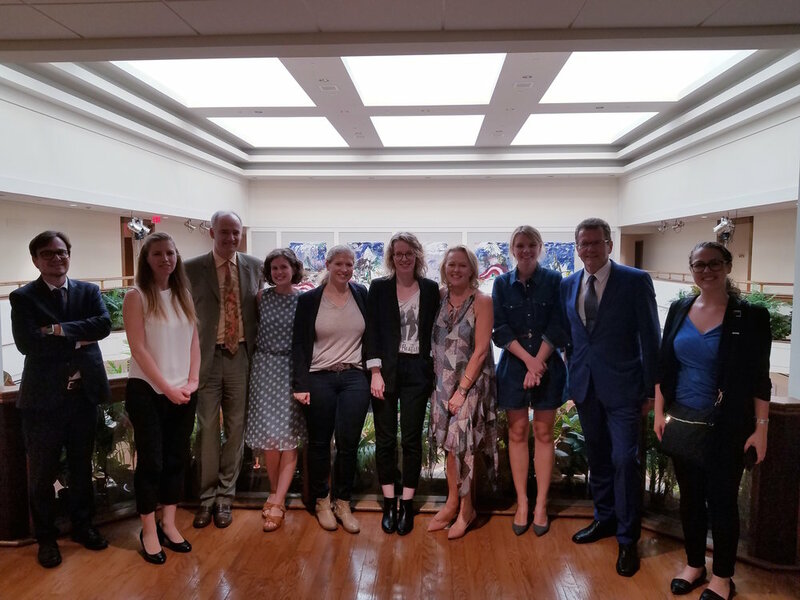 On September 5, 2018, Ambassador Wolfgang Waldner welcomed the selected fellows of this year's U.S.-Austrian Journalism Exchange program, which is administered jointly by the International Center for Journalists in Washington, D.C., and the Austrian Media Academy (Kuratorium für Journalistenausbildung) in Salzburg, to the Embassy. Each year three to six outstanding media professionals from the United States and Austria are being embedded in a partner media outlet to report from and travel in each other's countries. The seven-week program offers young print and broadcast journalists the opportunity to share professional expertise with their colleagues across the Atlantic while working as "foreign correspondents" for their hometown news organizations. The 2018 fellows are Lidia Jean Kott (from Washington, D.C.'s PRI's The World going to Vienna's FM4), as well as Vienna-based Josephine Nora Charlotte Roek (from Puls 4 to the NBC-affiliated TV station KGW in Portland, Oregon), and Christina Traar (from Kleine Zeitung to the Washington bureau of USA Today). The U.S.-Austrian Journalism Exchange program has been running since 2006 and is funded by donations from Austrian government and U.S. government agencies, private-sector corporations and foundations.